Defenders Rush uses new battlerager rules but also gains thp when visible allies are at risk ie lose real hit points from attacks by marked enemies. BRV can be based on CHA, WIS OR CON. Choose an extra skill power at level 1 associated with a trained skill free. For example, if you want to teach/know something about a religion, it would be Int+Religion. If you wanted to sway others to or express your faith, it might be Cha+Religion. If you wanted to pray to your god, it my be Wis+Religion. I remember you posting the backgrounds rule a long while back. I don't see the harm here. The Reaper's Touch feat rule is cool - it gives the casters a melee option of last resort, which is always nice. I know jack all about Battleragers, so I can't comment on that one. I do like the disconnecting ability modifiers from skills house rule, though it does make me wonder about how you'd run the social skills. Charisma tends to be "Social: the Attribute" in a lot of circles. 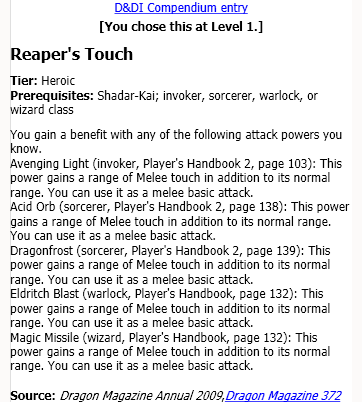 I'm not sure what the "Reaper's Touch" feat does. Other than giving it alternate names (Rune Weapon, etc.) and saying that it can be taken by those of any race, I didn't see a description of what that feat is supposed to do. For the Relevant Backgrounds Feat (it's a feat, I'm guessing), why are Scales of War and Forgotten Realms backgrounds are valued 3 times as much as other backgrounds? For the most part, all of the backgrounds just give a +2 to a single skill, a language, or allow a particular skill to be added to the class list. For the Battlerager stuff, I'd have to dig through those rules to comment. Is this a plan to change the base rules for BRV? Or a feat that the Fighter would take? I really like the skill powers and I don't know if you intend to just give all PCs a free one at level 1 or if this is a feat that a PC could take. But either way, I love the idea of putting more value on the skill powers. Disconnecting ability modifiers from skills... This is a tricky subject. I understand how sometimes the ability associated with a skill seems to be wrong. For example, if a Fighter wanted to intimidate someone by simply bending a steel rod with their bare hands, it seems almost silly to use Charisma as the modifier for that Intimidate check. At the same time, however, when the rules are opened up to allow the participants (DM and players alike) to give cause as to why a different ability should be used to modify a particular skill, it presents the opportunity for a lot of abuse. It definitely depends upon the group and their personalities, of course. My experience is that most players will just want to look at their highest ability and then try to reverse engineer a reason why they should use that ability to modify their skill instead of the standard ability. I know that not all players are like that. But making this change increases the chances of a disagreement between the GM and the players. The GM may say, "Okay, give me an Athletics check, but use your Con instead of Strength" and the player (who has a higher Dex than Con) would counter, "But I think Dex would be more appropriate because I'm trying to be agile while doing this" and argument/hilarity ensues. Everyone's experience will vary, I'm sure. I just alway think back to every single skill challenge that I would run (before I stopped announcing skill challenges) where the players would look at their character sheets, find their highest few skills, and then ask me "How can I use Nature in this skill challenge?" or "I'm going to use Stealth to get past these guards." after they had already walked right up to the guards at the gate. My point of all of this is that if you want to tinker with the skill system, that's awesome. I would recommend digging deeply into it before applying whole cloth changes. Maybe institute some specific instances where changes can be done (Like you had examples of, or like the Str/Intimidate example I mentioned) at first, and then expand from there. The damaging minions on a miss is a cool idea. I've also read (possibly on these boards) about the "two-hit mook". Basically, it has 2 hit points and any hit (or damage) against it is reduced to 1 point of damage. So the first hit makes it bloodied, the second hit kills it. I thought it was a very cool idea and it could change up some of the combat dynamics. Although in keeping with the game mechanics, I imagine that the XP awards for those minions would be increased slightly. Anyway, those are my first thoughts to these things. Mostly just musings in my brain. Discussion is always cool! Quick Comparison using a fairly bland one from Forgotten Realms and another from Scales of War. Gain a +2 bonus to checks with a single skill associated with the background. Choose one language connected to your background, and learn to speak, read, write that language fluently. AND add a bonus of +1 to your Perception bonus. I was indeed thinking about elaborating further each skill on what attributes might attach for different activities and I might as the DM indeed be asking for a specific pairing. Although if a player had an approach in mind I might also consider that. My players arent very rules baiters so it might only be a case of changing the character sheet in an elegant way to get this to work. You are right though this could definitely use some elaboration and thought. I dont mind minions mostly go down on 1 hit... I would like however minions to support the bloodied concept sometimes ... auto-damage however seems cheap if it just kills them outright or a real waste if it does nothing at all but a bloodied state allows them to interact better with other rules. Also i think finding a troup of (pre-bloodied) tired or wounded minions that a Warlord might unbloody with a speach seems flavorful. Is this a plan to change the base rules for BRV? Well given how dramatically they have changed first i have kept the rules as they used to be... and adjusted it slightly so that they only trigger thp for non-temp hp loss. So it is an existing feat. I don't mean to sound obtuse, but how is it a house rule if it is already in the game? My current group is not the sort to look for every single way to subvert and abuse the rules, but I've had my fair share in the past (hence my current group). But that aside, I do think it is a good idea to try to get a bit of an outline put together of the intended uses so that you have them up front and aren't stopping the flow of the game at the table when you stop to consider if Con or Cha is the better modifier to use for this particular implementation of Perception (to name a completely silly pairing of skills and abilities). A good friend played with a DM that had said that the correct interpretation of the Cleave power was that the extra damage done to an adjacent enemy would not kill a minion because "minions take no damage from a missed attack" and since there was no attack roll for that damage (against the minion) it was the same as a "missed attack". I bring that up only because I LOVE minions from 4E. I have used them liberally and to great effect in combat encounters. I had one encounter that essentially had an "infinite minion generator" where every round 1d4 Flamespiker Tongue minions would come through a portal from the Elemental Chaos. The party fought and fought and fought for rounds on end, waiting for the last of the enemies to finally come through. Finally, when they were all bloodied, and running out of resources, they finally thought, "Oh, they aren't going to stop. We need to close that portal!" And this was all from enemies that died with one hit. But yeah, I think there are narrative opportunities for a sort of "two-hit" minion or a "miss-and-bloodied" minion in the game. And actually, that's something about 4E that I think is great. The mechanics are so transparent that you can usually suss out what the effects of making a change to them will be. For example, there are plenty of abilities and powers and such that rely upon the Bloodied condition. Normally, minions don't get into that mix. But if minions can become bloodied, then they get into that whole mix of things as well. when you stop to consider if Con or Cha is the better modifier to use for this particular implementation of Perception (to name a completely silly pairing of skills and abilities). Generally speaking con could be used when you are on watch for an extended period of time its actually a pretty good alternative... guards and such on the wall when they are being starved out of the place might be using that con to stay focused. I am playing around in CBLoader and seeing how many house rules can be implemented there-in. Its easy to remove a racial requirement from a feat in CBLoader. I like this! I'd be inclined to keep the normal ability score attachment by default (so the players don't need to do maths every time they roll a skill check) but for relevant cases, swap it out. I must remember to give it a try. Glad you like it let us know how it works for you.